A new concept - the C-Aircross - has been revealed by Citroen ahead of a Geneva Motor Show debut. The C-Aircross Concept’s identity is inspired by the new Citroen C3, although shows a ‘new vision of the compact SUV’. With a fresh new external colour scheme, on the inside the C-Aircross Concept reflects a new step for the Citroen Advanced Comfort programme, with a light and airy cabin, and technologies that 'aim to make life easier'. 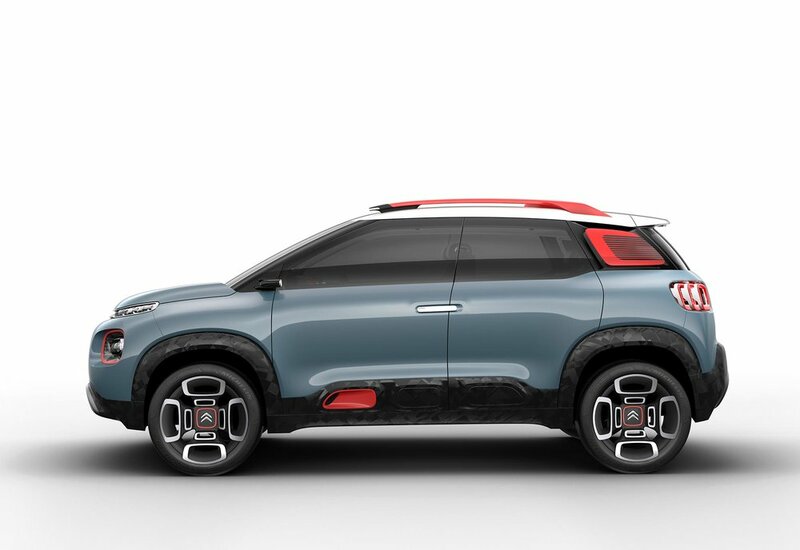 This interpretation of a compact SUV marks a new stage, says Citroen, in the deployment of its product strategy and follows the Aircross Concept from 2015. Design wise, the concept features a ‘strong, original and fresh design’ and is described as ‘assertive’ in appearance with its short and raised bonnet, and its sturdy front end. The split level light signature at the front is joined by daytime running lights integrated into the grille, and are separated from the main lights, which sit below them. The rear comes with new 3D lights, each with three floating sections. These rear clusters share their graphic design with the decoration on the floating and backlit rear quarter windows. A key design characteristic, the rear quarter windows were conceived as aerodynamic features of the car and conceal the interior of the vehicle without preventing light from entering the cabin. The exterior gives an impression of space on-board and once iInside, the use of colour and specially chosen materials creates a ‘modern and relaxed’ atmosphere, with an overall impression of minimalist style. The concept’s front doors – and the rear-hinged doors at the back – open to reveal a spacious cabin, with wide, quilt-effect seats and plenty of light from its large windows and panoramic sunroof. 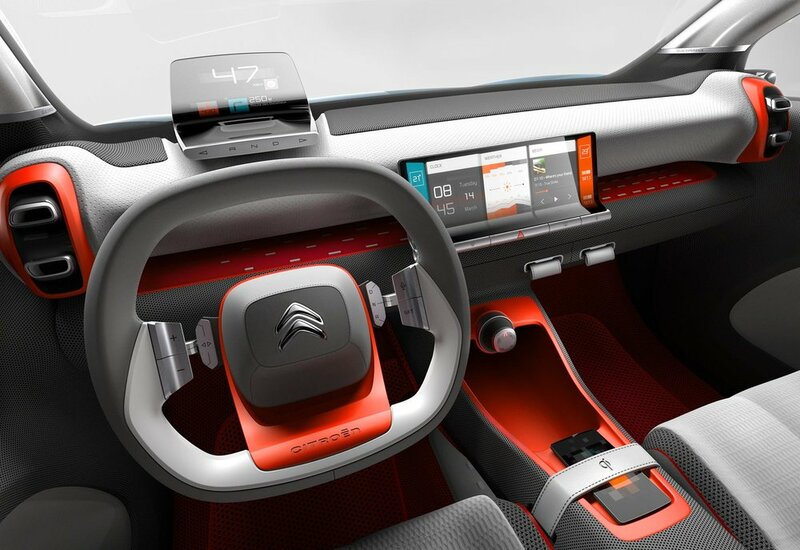 A colour head-up display, and single spoke steering wheel with intuitive controls are joined by rear facing cameras and wireless induction charging for smartphones. The SUV-style concept is equipped for everyday urban journeys or ‘mountain and coastal getaways’. The car comes with a Grip Control dial built into the central console for a more versatile drive, with 5 operational modes: STANDARD: This mode is for normal road conditions (main roads, motorways and urban roads) SAND: This mode uses the two front wheels simultaneously to reduce the risk of getting stuck in sand or on soft ground, OFF-ROAD: This mode acts as a Limited-slip Differential and ensures optimum traction on slippery surfaces (mud, wet grass or dirt roads), SNOW: This mode instantly adjusts the rotation of each of the driven wheels to the grip available on snow-covered surfaces and ESP OFF: This mode allows the driver to deactivate the ESP (active up to 31mph). "The C-Aircross Concept demonstrates Citroen's pursuit of its international product offensive. Based on the state-of-mind of New C3, it illustrates a different vision for the compact SUV segment, full of confidence and boldness. This concept also embodies the ambitions of the Citroen Advanced Comfort® programme, making its interior space a source of well-being." said Linda Jackson, Citroen CEO. The Citroen C-Aircross will receive a World debut at Geneva Motor Show on 7 March.